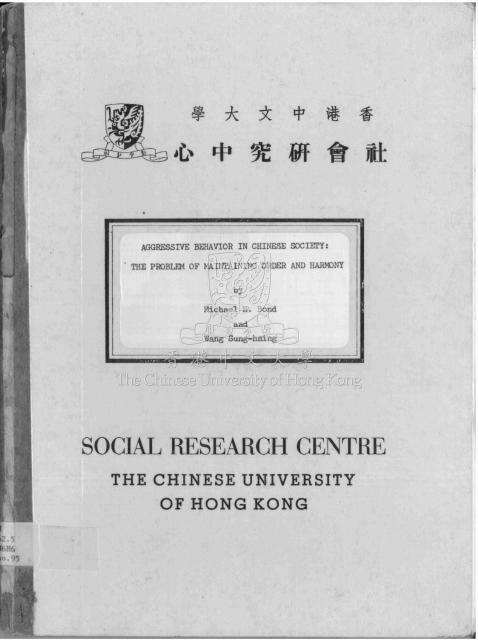 We have sampled from a wide selection of sources in this survey of aggression in Chinese people – philosophical writings, folk wisdom, anthropological observations, sociological surveys, and psychological experimentation. We have argued that the fundamental concern of the Chinese has been to maintain the harmony of the in-group, however defined. The source of authority in these groups is not the rule of law but an individual acting as a leader. Consensual validity about the characteristics of these leaders is achieved through traditional Confucian teachings with the consequence that, “長幼有序” (Each person has a ranking). The use of aggressive behavior to challenge these sources of authority is suppressed from an early age. High-density living and low residential mobility contribute their additional inhibiting effects on aggression. The net result is a low incidence of aggressive behaviors that present any challenge to this social ordering, e.g., physical violence towards peers or superiors. The obverse of this picture is the existence of two dramatic and extreme forms of aggression, public reviling and collective violence towards an out-group. The former, although colorful, has a ritualized quality and rarely leads to physical assault. This is not the case with collective violence where the aggression takes on what Zimbardo (1970) has called a “de-individuated” character – unrestrained, spiraling, and excessive. Paradoxically, both forms of aggression validate the importance of group membership in controlling the behavior of the actors. Public reviling is public to the group which can then pass judgment on the disputants; collective violence is undertaken by persons acting in a group which functions to legitimize its members’ violence towards those in the out-group.